It was the best of times and the worst of times. But 2009 will be remembered as a seminal year for the No Kill movement, as new victories combined with scandals on the part of the “catch and kill” establishment, to make “No Kill” a household word. The Humane Society of the United States and the ASPCA came off as the biggest losers, while No Kill advocates emerged to take center stage in the humane movement. The New Year opened in Reno, Nevada as it did all over the country, with a key crucial difference. On January 1, while many shelters closed their doors for the New Year’s Day holiday, the Nevada Humane Society stayed open for adoptions, and 49 animals found loving new homes. It was only the first day of the New Year but it turned out to be a harbinger of things to come. Combined with the retirement of the anti-No Kill director at Washoe County Regional Animal Services, the community finished with a 90% rate of lifesaving countywide, among the top in the nation. 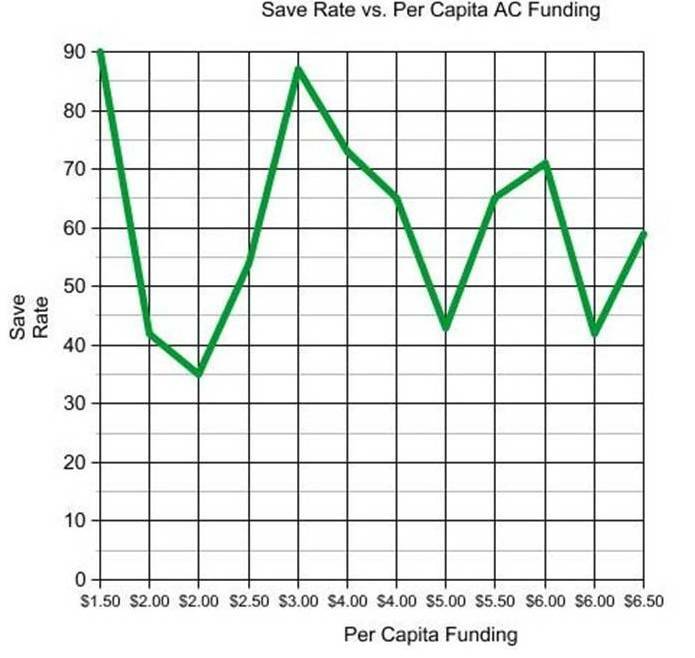 After increasing the save rate to 73%, from an 88% rate of killing just a few short years earlier, incompetence on the part of the Board and leadership of the Philadelphia Animal Care & Control Association caused Philadelphia to descend into chaos. 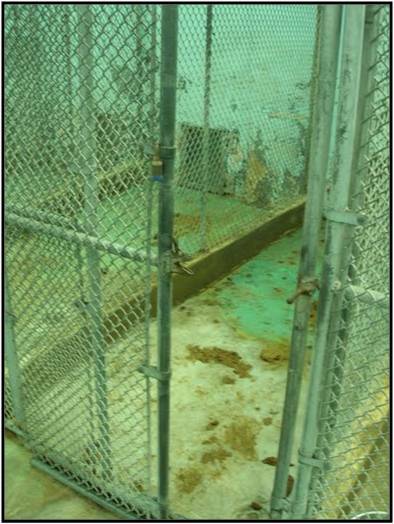 The Department of Public Health conspired with the leadership of the Pennsylvania SPCA and closed down PACCA, giving the animal control contract back to the PSPCA. 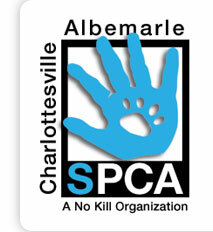 Just days later, the PSPCA CEO resigned amid turmoil within the agency. The numbers of dogs and cats needlessly killed in City shelters skyrocketed once more. Now with new leadership, will Philly succeed once more? 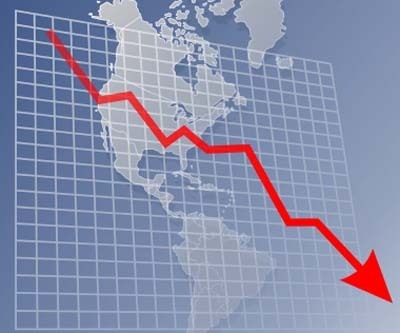 February Loser: Humane Society of the U.S.
At the end of 2008, Wayne Pacelle, the CEO of the Humane Society of the United States, stated that HSUS’ goal has always been a No Kill nation, and that HSUS has always been the leader in helping make it happen. The claim was insupportable given HSUS’ sordid history, and most questioned Pacelle’s sincerity. But everyone held out hope that this signaled a shift in HSUS policies. Hope turned out to be short-lived. 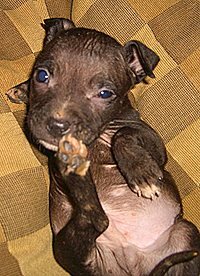 In February of 2009, Pacelle and his team at HSUS lobbied a court to kill each and every dog and puppy “rescued” from a dog fighter in Wilkes County, North Carolina. Pacelle refused to spare even nursing puppies (including the one pictured to the left), forcing a foster parent to return two of them for slaughter. The “Wilkes County Massacre” sparked national outrage and calls for Pacelle’s ouster. Others met with Pacelle in Las Vegas to force HSUS to end its policy of automatic destruction of dogs seized in dog fighting cases, including friendly dogs and puppies. The April announcement of success turned out to be premature, however, as Pacelle subsequently stated that dogs seized just a few months later in a Missouri dog fighting bust should be killed. He is half-ignored, as some of the dogs are placed with rescue groups. 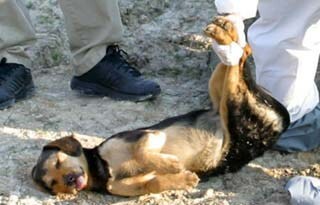 The rest are killed, however, and are placed into garbage bags even though HSUS had the power to save them all. The Animal Humane Society in the twin cities of Minnesota follows the Wilkes County Massacre with one of its own. 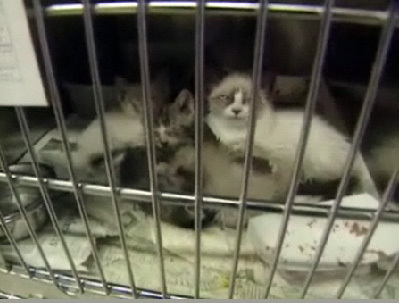 Roughly 120 cats it claimed to rescue from a hoarder are systematically put to death, some within hours of arrival (including those above), even though they were not suffering and Minneapolis’ largest No Kill shelter and scores of rescuers offered to help save them. In March, PETA reported its killing rates for the previous year: a staggering 95% of all animals it sought out. (The dog on the right was one of PETA’s victims, his body unceremoniously thrown away in a supermarket dumpster.) As animal lovers condemned PETA, PETA fired back by threatening lawsuits against critics, saying all the animals they killed were hopelessly ill. The threat proved specious, however, as PETA founder Ingrid Newkirk admitted in a Canadian television interview that they “absolutely” kill adoptable animals. 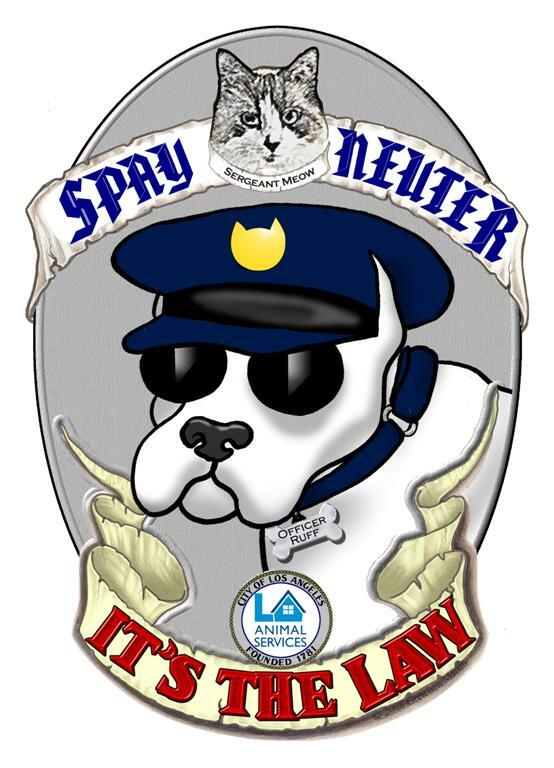 After Los Angeles passed a mandatory spay/neuter ordinance, city officials promised that the law would make it a No Kill community. But, consistent with results elsewhere, officers threatened low-income families with citations if they did not surrender their intact animals, which Los Angeles Animal Services then turned around and killed. For the first time in a decade, the number of animals impounded and killed increased—roughly 30% more animals lost their lives. Adding insult to injury in March, the city suspended the low cost spay/neuter voucher program which allowed some poor people to comply with the law. It was reinstated following a public outcry but this latest in a long line of scandals resulted in a unanimous vote of “No Confidence” from the city council. The beleaguered head of Los Angeles Animal Services resigned shortly thereafter. 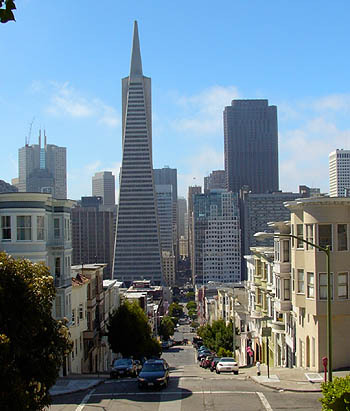 In 2009, San Francisco began debate on a city law that would end the needless killing of savable animals in local shelters. Ed Sayres, the former President of the San Francisco SPCA and now head of the ASPCA, sent a representative to testify at the hearing in March, who called No Kill “radical” and asked the city to continue the status quo. Not to be outdone, Wayne Pacelle of HSUS also told the City to reject the No Kill legislation, and this allow the SPCA and animal control to continue killing. While San Francisco—the birthplace of the modern No Kill movement—continued killing savable animals, No Kill finally came to the Bay Area. Four East Bay communities ended the killing of healthy and treatable animals, announcing a 93% rate of lifesaving. What were 2009’s most progressive animal shelters in Indiana? If you guessed the ones in Indianapolis, you would be wrong. Indiana is the home of two No Kill communities, but Indianapolis isn’t one of them. To their credit, Indianapolis activists in April successfully derailed proposed breed discriminatory legislation that would have condemned dogs deemed “Pit Bulls” to death. Leading the opposition was a newly hired Indianapolis Animal Care & Control chief who also announced an overturning of the automatic Pit Bull killing policy he inherited. Taking his cue from success elsewhere, the director also stood up to union-protected shirkers, taking an agency beset by neglect and cruelty to one that put the animals first. On July 4, when the shelter was historically closed, he stayed open until 10 pm for a holiday adoption campaign. The result: 153 animals who would have been killed in years past were adopted, a single day record for IACC. But victory in Indianapolis turned out to be short-lived. 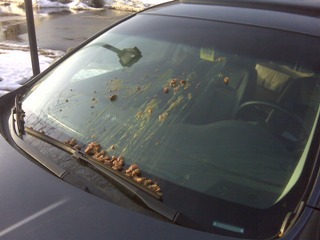 The director’s car was vandalized twice as the union fought back and won—which meant the animals lost. Recently uncovered documents show a conspiracy between city bureaucrats and the Humane Society of Indianapolis to undermine the progressive director. Following his ouster, killing resumed at IACC with a vengeance. While Indianapolis animal shelters don’t even come close to earning the label “progressive,” they do have that car race: 500 laps of going around in circles. There’s a metaphor in there somewhere. While communities like Charlottesville continued their No Kill success, newcomers like the Nevada Humane Society joined the 90% club. 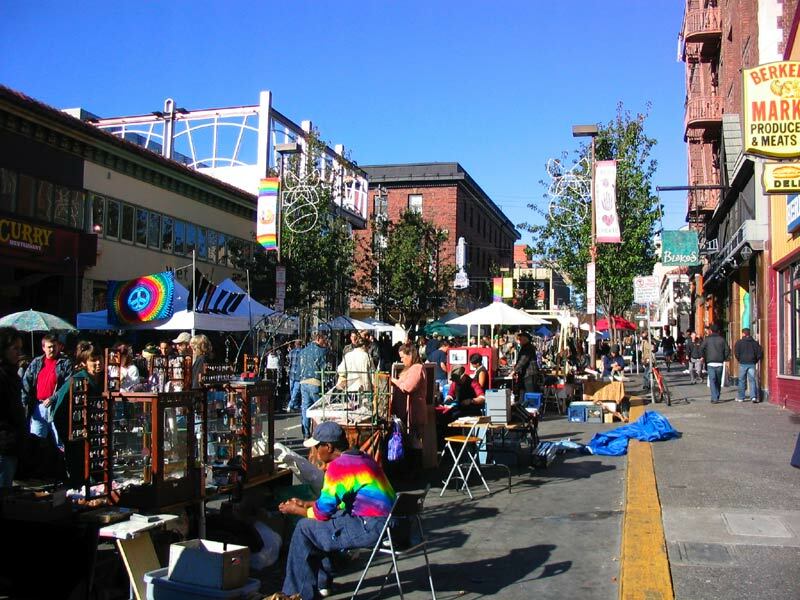 Not to be outdone, other communities announced similar success including those in Utah, Kentucky, Kansas, Colorado, and elsewhere. Hosted by the No Kill Advocacy Center and the Animal Law Program at George Washington Law School, the No Kill Conference rocked the nation’s capital. Featuring the country’s most successful shelter directors, shelter reformers, and animal lawyers, the conference sold out two months in advance, spreading the No Kill message to representatives from over 30 states and six nations. Despite a series of scandals in 2009 that made No Kill advocates and animal lovers think he could not sink any lower, Wayne Pacelle stunned the nation by embracing the most notorious animal abuser of our time: Michael Vick. 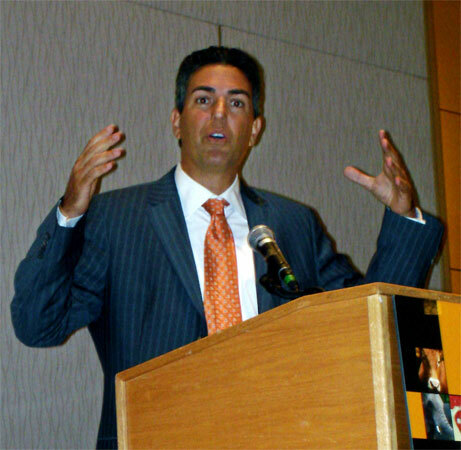 While HSUS testified that the dogs Vick abused should not be given a second chance and should all be killed, Pacelle said that their abuser should be. 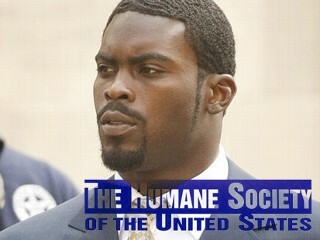 Vick became a spokesman for HSUS. Or was it the other way around? The bible of the No Kill movement, Redemption: The Myth of Pet Overpopulation & The No Kill Revolution in America, won its fifth national award and went into a second edition printing. It continued to send shockwaves through the movement and was once again credited with helping to transform communities in the U.S. and, in 2009, abroad. Three national studies confirmed the claims of No Kill advocates: breed bans are costly and don’t work, pet overpopulation is a myth, and success is defined not by how big a shelter’s budget is, but the size of the shelter director’s heart. Investing in leadership pays off big. Making yet another disturbing appearance on the worst of 2009, Sayres and Pacelle return for more ignominy. After his release from prison, Pacelle and HSUS help the most notorious animal abuser of our time get reinstated into the National Football League, erasing any punishment and making Vick a millionaire once more. 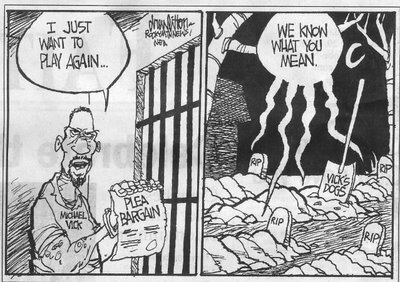 Vick gets his life back, while the dogs he killed are still, well, dead. As dog lovers across the country cry foul, Ed Sayres of the ASPCA calls the NFL Commissioner’s decision to reinstate Vick “thoughtful.” Vick follows up by saying he wants dogs again: will HSUS help him with that also? And will the ASPCA call that result “thoughtful”? The largest raid against dog fighting in U.S. history occurs, with over 400 dogs seized by authorities in several states. Most of the dogs ended up in a Missouri humane society. While Wayne Pacelle said killing was the only recourse, hundreds instead went to rescue groups. But after walking away from the dogs, HSUS then turned around and dishonestly fundraised off of one of the victims at the end of the year. Replete with misinformation and outright lies—including their failure to even get the spelling of the dog’s name right—HSUS said it hoped to raise $1,000,000 from unsuspecting donors. After the humane community—and the dog’s foster parent—cried foul, HSUS announced it would donate $5,000—only about ½ of 1% of the expected take—for the dog’s surgery and pocket the rest. Even HSUS’ false claim of a happy ending turned out to be premature: Fay died shortly thereafter. A national study showed that shelters misidentify breeds as much as three-fourths of the time. 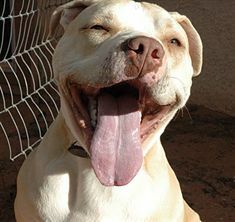 Calls to end the needless killing of “Pit Bulls” and dogs mistakenly classified as “Pit Bulls” gained momentum in cities like Denver with regressive anti-dog breed bans. Some communities went a step further and repealed their bans. With killing on the increase in some communities, shelters in those areas blamed the economy. But the truth was more sobering as the correlation between declining economic indicators and shelter killing rates didn’t pan out. Some communities, including those hardest hit by the recession, continued to increase rates of lifesaving when they were run by progressive shelter directors who followed the No Kill Equation model of sheltering. By contrast, those communities least impacted by the recession, nonetheless, saw killing increase, when their shelters were run by regressive directors who found killing easier than doing what it took to stop it. 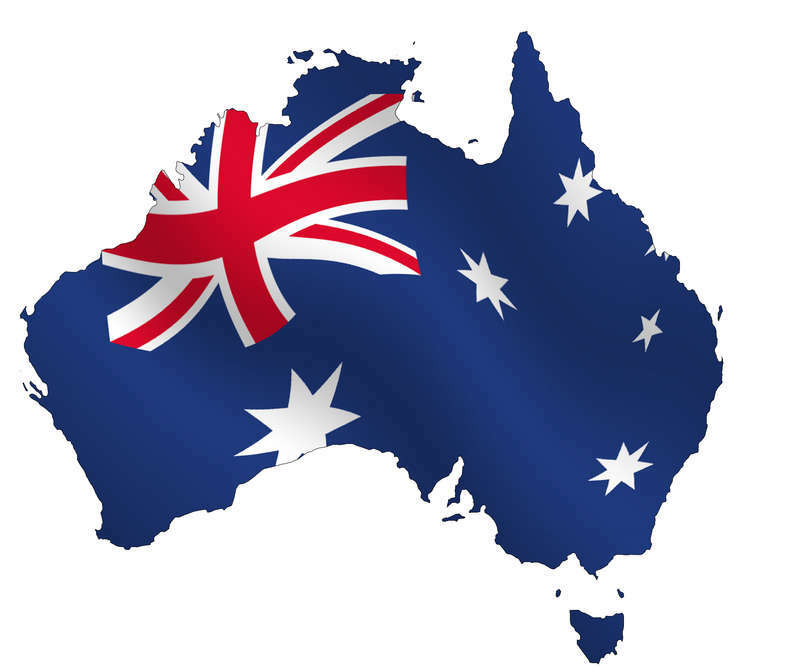 The No Kill Equation goes global as the model is embraced by both Australia and New Zealand. A national Australian conference headlines the No Kill Equation and highlights two Australian communities saving 90% after following the model. The race is on to see which country—the USA, Australia or New Zealand—will become the first No Kill nation. 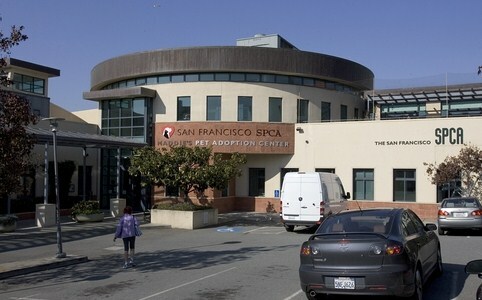 The once mighty San Francisco SPCA is rocked by a series of scandals culminating in an expose showing the former crown jewel of the No Kill movement is a shell of its former self. The scandals are followed in November by the announcement that its beleaguered director will resign. Scandals explode all over the country. In Memphis, TN, the shelter is found to starve animals to death. In Lucas County, OH, the director is found to kill animals even in the face of readily available alternatives. In King County, WA, a whistleblower confirms staggering levels of neglect and cruelty in the county shelter. HSUS’ call for National Shelter Appreciation Week is ridiculed as out of touch. 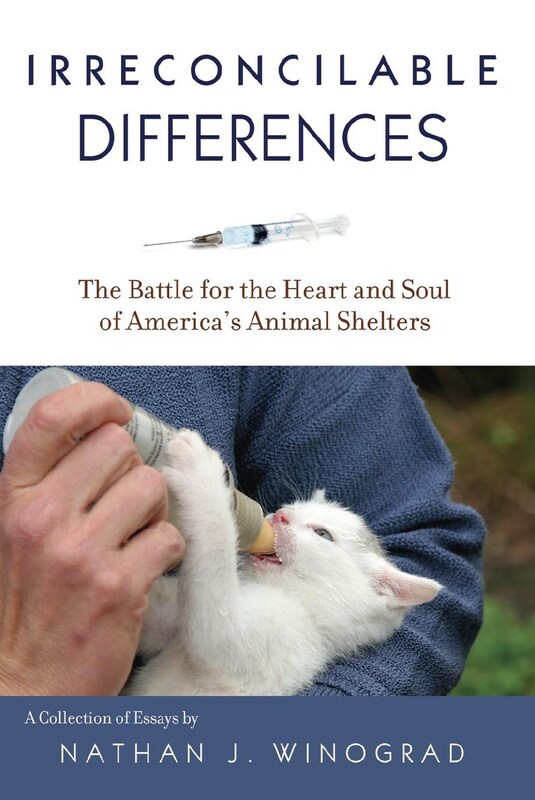 Irreconcilable Differences: The Battle for the Heart & Soul of America’s Animal Shelters, the long awaited follow-up to Redemption, is released to rave reviews. In response, Wayne Pacelle followed up with a temper tantrum proclaiming he is the leader of the No Kill movement, attempting to rewrite history and his agency’s sordid history of fighting No Kill. Bowing to public pressure, municipalities across the country acknowledged and condemned the neglect and killing by their own pounds/shelters. King County (WA) officials announced they will close their abusive shelter, while the Austin (TX) City Council unanimously embraced a No Kill resolution. 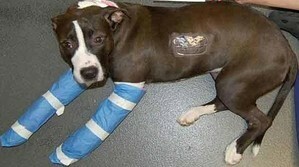 An abused dog who survived being thrown from a sixth floor Brooklyn rooftop does not survive the “rescue” by the ASPCA. Ed Sayres, the President of the ASPCA, ordered a dog named “Oreo” killed despite the offer of guaranteed lifetime care by a No Kill sanctuary. Dog lovers across the country are outraged, prompting two New York State legislators to introduce “Oreo’s Law” which would prevent shelters from killing animals when a rescue group offers to save that animal’s life. Leadership of the No Kill movement, the nation’s top animal law professors, rescuers and shelter reformers across New York State and the country immediately embraced the legislation. Only the ASPCA came out in opposition. A few weeks later in December, the ASPCA does it again, killing a dog named Max despite a sanctuary’s offer of lifetime care. 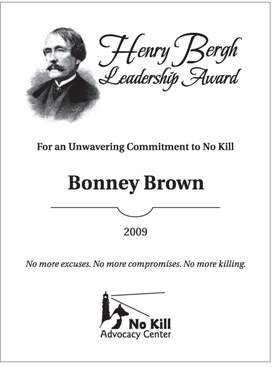 As No Kill takes center stage all across the country in 2009, six recipients are given the No Kill Advocacy Center’s Henry Bergh Leadership Award as the nation’s top No Kill advocates.